These days, everyone wants a dazzling smile. Research has shown how important appearance can be for self-confidence and attaining both professional and personal goals. Teeth whitening can be an easy way to improve your appearance, and at Cowlitz River Dental, we can help you with both in-office and take-home teeth whitening. 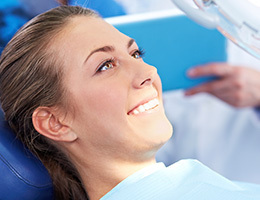 Professional teeth whitening provided by a dentist is leaps and bounds above over-the-counter teeth whitening methods. If you’re preparing for a big event – a wedding, a job interview, a banquet, or the prom – consider a trip to Cowlitz River Dental in Castle Rock, Washington to explore your teeth whitening options. In-office teeth whitening is great for patients who have a big event coming up. Right before your event, we can help whiten your smile in a single procedure in our Castle Rock, WA dental office. We can also combine your in-office teeth whitening with take-home teeth whitening to help you maintain your results. This one-two teeth whitening punch will help you have a whiter, brighter smile that lasts. Take-home teeth whitening from a dentist is not to be confused with over-the-counter methods. We will create custom-fit whitening trays that fit your smile like a glove and provide you with professional-strength teeth whitening gel. With the custom trays, you get great coverage and comfort. We can combine teeth whitening with other cosmetic dentistry treatments to really give your smile some oomph. At Cowlitz River Dental in Castle Rock, WA, we want you to be happy with your smile. Contact us to make an appointment for teeth whitening or any of our other cosmetic dentistry treatments. We can perform a complete cosmetic consultation to help you figure out how best to improve the look of your smile. With a conveniently located office in Castle Rock, WA, we help patients from nearby communities in southwest Washington and northwest Oregon.